I am craving some dark, leafy green kale. And a ripe, juicy tomato. And I am somewhat demanding because I want it to be picked this morning and delivered today. Looking out the window this morning at my snow-covered part of the world, I am guessing that this is not going to be happening. Sigh. Lucky, lucky me, this is actually what I experience from early June right up until Thanksgiving, thanks to my CSA. CSA, or Community Supported Agriculture, is one of my favorite things. We practice organic and sustainable farming methods, without the use of any chemical herbicides, pesticides or fertilizers. Our regular season share is chock-full of over 40 different crops including lettuce, corn, carrots, beans, tomatoes, peas, squash, potatoes, garlic, broccoli, beets, onions, melons and more. Our main season runs for 18 weeks, from June to October. Our share comes in a large reusable crate which, depending on the time of year, contains from six to 26 pounds of produce. Your share also includes our informative newsletter that tells you what’s in the box and what’s going on at the farm. In addition to the vegetables we offer maple syrup, honey, fruit and some organically raised meats for sale from other farms and friends. 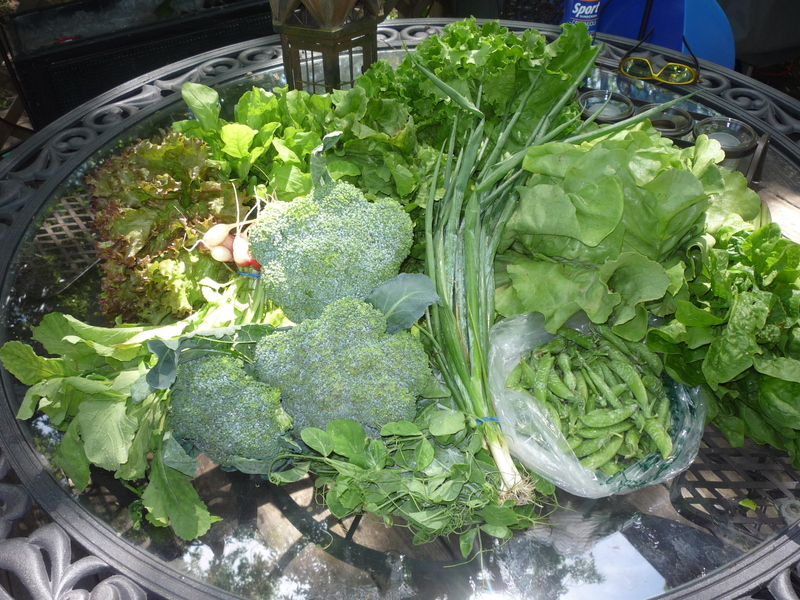 Here’s what I received the first week of the CSA last year. I was so excited! And this was at the beginning of the season, when the garden is just getting started. At the end of summer, the boxes are huge! My CSA is Hogs Back Farm, but you can find your own right here. Procrastinators, pay attention: Leaving it to the last minute is not an option. You must sign up in the next month or so if you want to have a CSA share in the summer. How to choose? You can make your selection based on location of pick up, price, selection, and more. A lot of people have asked me how expensive a share is. Our full share works out to $33 a week. Given that we don’t have to buy any additional produce, and what we receive is local and fresh and organic, I think that’s a very reasonable price. Others have asked how I know what to do with all of the vegetables. For me, one of the greatest advantages of having a CSA is that we get to try things we wouldn’t normally pick up at the grocery store. The newsletters that come every week provide lots of information and recipes to help us get to know what we are eating. Best of all, my kids eat a lot more vegetables because they look and taste so fresh and appealing. I think I’ll follow Anna’s advice and make some soup. I have made this one without the mussels and it is exceptionally delicious. Hopefully it will satisfy some of my cravings. I am a CSA junkie. We had one in Charlotte and now here, too. LOVE it! And I’m sure you’ve probably tried Chocolate Beet Cake? I’ve tried several recipes, many of which leave you pretty aware there are beets inside. But now I have one that is phenomenal. I’ve made it for TONS of people (because of the ridiculous stockpile of beets I have) and they are shocked when I tell them it’s beet cake. If you ever want to give those little purple roots another try, I can pass this one along. Mary, I would love the beet cake recipe….I have done Zucchini Chocolate cake and it was delicious. For those who have the time, love gardening (or want to learn), and are in close-enough proximity to a CSA that they love….You might want to check into the possibility of trading garden work for a share (and more) with a CSA!